John D. Digiacomo, 45, assistant Northampton County solicitor and former county solicitor, died Friday (May 11, 1984) in Thomas Jefferson Hospital, Philadelphia. Mr. DiGiacomo, of 407 Dogwood Terrace, Forks Township, was a partner in the law firm of Teel, Stettz, Shimer and DiGiacomo. He served as assistant county solicitor since 1978, with a brief stint as county solicitor in 1981. He returned to his assistant solicitor's post in 1982. As assistant county solicitor, Mr. diGiacomo provided legal counsel for the county prison and other county offices. He also was the solicitor for the Easton Area Board of Realtors. He served as coounty assistant public defender from 1967 to 1970 before being apointed public defender for 1971-1972. He also was a former member of the Easton Housing Authority. He was admitted to the Northampton County Bar and permitted to pratice law before the Pennsylvania Supreme Court in 1963. He recieved his juris doctorate from the University of Pennsylvania Law School that year. Born in Easton, he was a son of Peter DiGiacomo and the late Sarah Morse DiGiacomo. 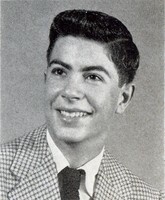 He graduated from Temple University in 1960 and Easton High School in 1956. He was a member of the Northampton County Bar Association, and The American Bar Association of Trial Lawyers of Pennsylvania. He also was a member of St. Anthony's Catholic Church in Easton, where he was a lector, and secretary and past president of the Easton Suburban Kiwanis Club. Surviving in addition to his father are his wife, Carole Lecher DiGiacomo, a son Peter, at home and a daughter, Heather, at home. Funeral servicse will be held at 9:15 a.m. Tuesday at the Morello Funeral Home in Easton, followed by a Mass of Christian Burial at St. joseph's Catholic Church at 10 a.m.
Interment will br in the Northampton Memorial Shrine.